We regret to inform you that RVs Without Borders is shuttered at this time. Also consider that this might be unlike any “charitable contribution” you have ever made because unlike writing a check, you can be directly connected with one person/family in a manner that changes their lives. You will personally experience the big impact you can make and probably make new lifelong friends. Inspections of RVs prior to transfer is important, not because we want perfect RVs, but because it is important for recipients to know the condition of the asset for which they accept responsibility. Also in the past, unfortunately, a small percentage of donors viewed this as an opportunity to discard RVs that were un-sellable on the open market and probably headed for a junk yard. This is what you can anticipate in our process as we move forward. We have done this before and documented how. This situation is VERY DYNAMIC and challenging, so the more organized you are with this information, the more effective we can be in helping those that need it. Provide a place for inspection and appraisal with access to shore power and water. By sharing what we learned from past experiences to face future disasters, we can leap beyond yesterday’s wisdom. Suggestions to improve are always welcome. ~ Thanks for visiting! Offer to home HOST a displaced neighbor in an RV near their original neighborhood. 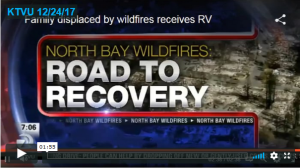 Offer to LEND or DONATE your RV to a displaced resident. If you know someone who qualifies for a donated RV or needs a charitable rate RV (There are costs for utilities, insurance and such), they can apply here. If you would like to VOLUNTEER with community outreach, or responding to requests for aid, please contact us here. Please note, if you or someone you know is an RV MECHANIC and just moved here or would like to, please let us know! Tell your friends and SHARE our FaceBook page. Can we please enjoy the spirit of Christmas every day? Click here to learn more. Thank you to our friends of RVsWithoutBorders for making this project possible.